Clear. Windy this evening. Low 46F. W winds at 20 to 30 mph, decreasing to less than 5 mph. Winds could occasionally gust over 40 mph..
Clear. Windy this evening. Low 46F. W winds at 20 to 30 mph, decreasing to less than 5 mph. Winds could occasionally gust over 40 mph. 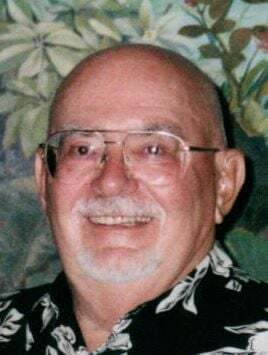 Joseph Burke “Hank” Gerlach passed away peacefully on Monday, February 11, 2019 in Napa. Hank was born on August 21, 1934 in Chattanooga, TN where he was raised with a large and loving extended family. In 1945, at the age of 11, Hank, his mom and dad, and sister Adele moved to Vallejo, California, leaving behind his many aunts, uncles and cousins with whom he shared a tight bond. The nickname, “Hank” was coined when his Uncle Joe, who admired Hank Greenberg, the baseball star of the day, decided to avoid the confusion of having two “Joes” in the family. Hank adjusted quickly to his new home, building many friendships on the ball fields of Vallejo. He was a three-sport star and student body president while attending St. Vincent’s High School in Vallejo, and it was during these years that he met “his gal Sal,” Sally Herlocker. Hank and Sally graduated from St. Vincent’s in 1952, and were both inducted into the St Patrick’s – St Vincent’s Hall of Fame in 2002. After high school Hank proudly enlisted in the United States Marine Corps where he served in Korea. Upon completion of his duties with the USMC, at the rank of Sergeant, Hank returned to Vallejo where he and Sally were married in 1955 and soon started their family. The family values learned as a boy were evident in the way in which Hank and Sally raised their seven children. In 1967 the family moved to Napa, living on MacLennan Street, until they sold their family home of 51 years to move to The Meadows of the Napa Valley last year. Hank spent his 30 plus year career at Mare Island Naval Shipyard starting as an apprentice electrician working on submarines, and rising to Manager of Quality Improvement before his retirement in 1989. In addition to raising his large family and building a successful career at Mare Island, Hank shared his passion for baseball where he was known as a highly regarded and well-liked coach, helping to develop many young Napa ballplayers. Hank supported and attended all of his children’s and grandchildren’s activities, such as school performances and class projects. He drove all over California to watch their sporting events, cheerleading performances, and graduations. He took great pride in his family and they were always his priority.After retiring, Hank enjoyed traveling with Sally, especially to Hawaii. They had a fun circle of friends with whom they shared weekends at the coast, trips to Cabo and Carmel, as well as lively dinner parties. Hank leaves behind his wife of 64 years, Sally, his sister, Adele Gerlach O.P., and his children: Molly LeMasters (Tom), Thomas, Ted (Jodi), Todd (Liz), Jane Doshier (Bob), and Leigh Wilkens (Brady). Hank was predeceased by his daughter Nancy, his son Tim, and granddaughter Jill. Hank also leaves behind 16 grandchildren and four great grandchildren with another due in July. Friends and family are invited to attend a memorial mass which will be held Friday, February 15, 2019, at 2:00 pm at St. Apollinaris Catholic Church 3700 Lassen St. in Napa. A reception will follow in the St. A’s Hall.